Now, order by Dececmber 15th and receive 10% off. Use the code "WITI" code at checkout to get your discount. Visit www.revivenow.com or call 1-877-REVIVE1 (1-877-738-4831). Perhaps you've noticed a trend? WITI hosted An Evening With Tom Peters, and we learned how "Women Rule." Women are the power behind 83% of all consumer purchasing decisions and a growing number of corporate choices. Women are more intuitive and work more willingly with collaboration, two traits required by the economy of the future. However, the recently launched WITI Watch confirms that corporate America is still not taking seriously the contributions or potential of women. Women hold less than 15% of board chairs in Fortune 500 companies, most of them at toy and cosmetic companies. Are you getting enough rest? Lack of sleep can make you vulnerable to a host of illnesses like colds and the flu that can put a damper on your holidays and can even put you at risk for more serious illnesses, such as heart disease. In a new National Institute of Health (NIH) study, women heart attack survivors recalled unusual fatigue (71%) and sleeplessness (48%) in the month before their heart attacks. Another study found that consistently getting less than five hours sleep, even if only twice per week, triples your risk of heart attack. If you experience unusual sleeplessness, check with your doctor right away. WITI is pleased to announce that Mellanie True Hills, The Health & Productivity Revitalizer, is now a featured columnist for WITI and will be providing regular health tips and feature articles in the Strategist and at the Web site. For tips on getting enought rest, visit WITI's Health Channel. In the survey following her recent article, Take Back Control... Your Health Depends On It, you told us what topics you're most interested in, and Mellanie will be focusing on those topics in upcoming issues. If you'd like to provide additional feedback, please go to the survey and give us your input. Women are behind a much larger number of inventions than they are generally given credit for, a researcher has found. Deborah Jaffe has recently finished work on a book, Ingenious Women, in which she has investigated the female inventors who have changed the world with their ideas. They include the windscreen wiper, the dishwasher, filter coffee, and the technology behind the bullet-proof vest. "When I was writing the book people said to me, 'but women have never invented anything'," Ms Jaffe told BBC World Service's Everywoman programme. "I found proof. Some of them are famous and some of them are not, but that doesn't matter." For the rest of this article, please visit the BBC's website. 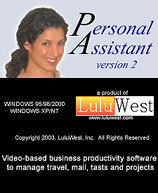 LuluWest Inc. is the developer of business productivity software for individuals, companies, and community-based organizations. We combine innovation and technology with sound business practices to create software products that are practical, efficient and easy to use. The flagship product, Personal Assistant (PA) exemplifies the corporate philosophy by integrating voice and video into business software. PA is the only video-based Personal Information Management system designed specifically for executives, office administrators and traveling professionals. As a member of WITI and the WITI Marketplace, LuluWest would like to offer all WITI members an additional 10% off of the currently discounted holiday pricing. Happy holidays from LuluWest! This is the first study in a research program on work-related burnout in IT professionals by researchers from the E.J. Ourso College of Business at Louisiana State University. A recent study by the technology advisory firm Meta Group reports that 71 percent of IT managers surveyed believe that employee job burnout is a serious problem for their company. In addition to the personal costs of work stress for employees, the business consequences for firms can include higher turnover rates, lower productivity, and even reduced shareholder value. While other studies have examined burnout in professions such as nursing, social work and policing, the purpose of this study is to gain a better understanding of burnout in the IT profession, and to develop management guidance for interventions that can be taken to prevent or reduce burnout. The study is looking for volunteers who have either experienced work-related burnout themselves or have observed other IT professionals who have experienced burnout. To participate, volunteers just need to fill out a short web-based questionnaire. Visit their site for more information. People are their best when they are striving to exceed accomplishments of the past. Our company has a long-standing commitment to redefining world-class business performance and standards of operational consistency, accuracy and efficiency. We have long insisted on continuous improvement and the sustained intensity that drives it, promising never to settle for an industry benchmark or our own historical performance. We have said our goal is nothing short of becoming the world's most admired company. This drive to excel can be summed up in two words: Higher Standards. This is our goal in everything we do. American has attained a leadership role in the aviation industry through a history of innovation and professionalism. Competitive challenges have spurred vast changes in our business, making American an exciting company at which to work. Our IT management team, a group of professionals with experiences, backgrounds and ideas as varied and unique as the places we fly, is without peer in the industry. We are committed to hiring, training and developing candidates with a strong desire to learn and grow, both personally and professionally. We are currently looking for two professinals who will serves as Project leads responsible for managing information technology systems, staff, and projects at the Alliance Maintenance Ft. Worth TX or Tulsa OK bases. Interacts with maintenance and engineering personnel to develop and refine requirements for information technology projects. Drives for results as project lead for Maintenance and Engineering (M & E) technology initiatives. Manages information technology projects through integrated process life cycles. Ensures projects are delivered to the customer on time, on budget and meeting customer expectations. Provides technology consulting on complex projects and technical support to M & E customers. SVASE presents "Tim Sanders & Company Cultures That Hit The Bottom Line!"